Does your dyslexic child love to build or draw things? Is he or she fascinated by how things work? Does your child surprise you with his ability to “see” things in his mind’s eye? This may be evidence of a budding talent that can lead to a successful career in a field that relies on visual-spatial thinking. For years people have wondered if individuals with dyslexia, who have weaknesses in left-brain-based language processes, might have higher than average right-brain visual-spatial abilities because of the different way their brains are wired. It seems logical that "that the same brain organization that leads to language disabilities for dyslexics might also lead to certain high level abilities." (Norman Geschwind). The scientific evidence has built to suggest that many dyslexics do, in fact, have stronger visual-spatial abilities than their non-dyslexic peers. Dyslexics evidence an enhanced ability to process visual-spatial information globally (holistically) rather than locally (part by part). This may be why individuals with dyslexia are over represented in fields such as architecture, art, engineering, and the sciences. In discussions with successful dyslexics in these fields the capacity to “see” things differently comes up with remarkable frequency. My dyslexic son displayed a talent in visual-spatial thinking at a young age. Because so much of his school day was spent feeling less capable than his peers, we decided to focus on enrichment in this interest/talent area so could feel good at something. We bought books about how things work, helped him enter a Lego building competition, enrolled him for the Johns Hopkins Talent Search Spatial Test Battery, let him take apart and build mechanical objects around the house, enrolled him in summer engineering programs, helped him find an internship at an engineering firm, and did everything we could think of to help him develop his strength. Being good at something helped him get through the elementary and middle school years with his self-esteem intact – and ultimately helped him get into a good college because he had achievements in an area of passion. He majored in physics and is now a rocket engineer. 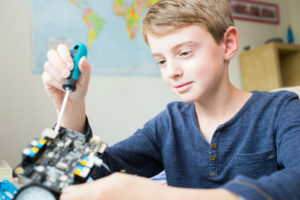 He feels that his ability to picture things in his mind has enabled him to design original parts and envision how the engineering development process will flow better than many of his non-dyslexic peers. When I work with dyslexic children who display an exceptional strength in an area like visual-spatial ability I often describe it to them as a “super power.” Something that makes them special and unique. Drs. Brock and Fernette Eide, who founded Dyslexic Advantage, have developed questionnaires to help identify the strengths associated with dyslexia. I’ve adapted some of their work to use in my assessment practice. If you answer “strongly agree” or “agree” to a majority of the questions below, your dyslexic child may have a gift at visual-spatial thinking – a “super power” that could lead to a career in a visual-spatial area and/or an enjoyable life-long hobby. If you would like to learn more about how to identify and develop your child’s strengths, I am happy to talk and can be reached at: devon@drdevon.com. My child is good at forming 3D pictures in his head, and I believe he can manipulate them and move through them in his mind when he wants to. When my child draws, he likes to use 3D techniques like perspective or cutaways. My child likes it when teachers use pictures and diagrams to explain things rather than just words. My child is good at building things (e.g. Legos, K’NEX, marble runs, arts and crafts projects). When he plays a video game, it’s easy for my child to learn his way around the virtual environment. When my child puts together a kit (e.g., Legos, toys or models), he usually doesn’t have to read the written instructions. He can just tell how things must go together by looking at the pictures. After going someplace once, my child usually doesn’t need directions, a GPS, or a map to find it again. My child would rather learn new information using pictures, diagrams, graphs, videos, or maps, instead of just reading or listening to words. When my child thinks through a problem, his thinking is often more non-verbal (visual images) than verbal (words). Before he can describe what he thinks about something, my child often has to translate his thoughts into words (up to that point, his reasoning process hasn’t used primarily words). My child likes learning about engineering, architecture, design, and physics. My child enjoys activities that involve moving through space in complex ways (e.g. sailing, flying, skiing, snowboarding, surfing, dance). My child is good at recalling 3D details about things or places he’s been, like how big things were or where they were in relation to each other. My child likes looking at 3D structures and figuring out how they work (e.g. engines, clocks, household appliances).